The Dodge NASCAR program might be facing a questionable future with their only major Sprint Cup team moving to Ford next year but the Chrysler Group is spreading to new forms of racing and next Monday, the folks from SRT Motorsports and Dodge will hold a press conference to announce a new racing venture featuring the 2013 Dodge Dart. The only information that is known about this press conference Monday is that Dodge brand CEO Reid Bigland, SRT and SRT Motorsports CEO Ralph Gilles and an unnamed new driver will come together to announce the first factory supported racing application of the new 2013 Dodge Dart. During this presentation, the Dodge and SRT boss will answer questions from the folks attending the meeting in person along with fielding questions from viewers watching on the internet around the world. 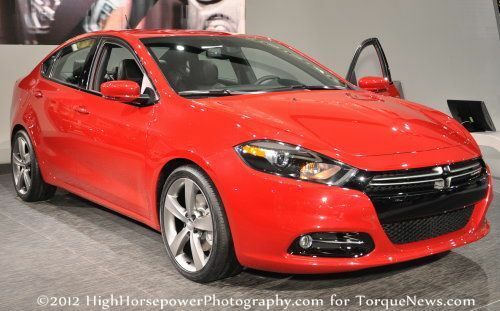 Unfortunately, there has been no indication given as to what kind of racing the 2013 Dodge Dart will be doing or who the new mystery driver might be. The popular rumors around the internet suggest that Dodge and SRT Motorsports will team up to get into the world of rally racing but other than rally-type racing, there aren’t many professional racing leagues in the US that could “fit” a front wheel drive 4-cylinder compact sedan. It could be that SRT has really dolled the Dart up for racing and the Chrysler Group is going to take the car into the world of time attack racing. Like rally racing, time attack has seen its popularity grow over the past few years thanks to the attention brought to these “new” forms of racing via events like the ESPN X Games. Ford has hit the rally scene hard in contracting drivers like Ken Block and Top Gear USA host Tanner Foust and General Motors has begun using off-road racer Ricky Carmichael so the General is also acknowledging the growth of new forms of racing. With GM and Ford Motor Company both getting more and more involved in forms of racing other than NASCAR, hopefully Dodge will use the sporty new Dart to toss their hat into the muddy ring of rally racing. Keep in mind, Dodge, Mopar and SRT Motorsports have already shown interest in rally racing with the introduction last year of their purpose built Dodge Avenger rally car but with the new, compact Dodge Dart – perhaps Ma Mopar will take a shot back at the crosstown rivals. The announcement of this pending event mentioned that this is a new race venture for the company and with no real history of Chrysler Group products competing in the world of rally racing – it would make good sense to show off the performance of the Dart in the off-road world.